Writing in the February 2015 issue, the four-time Olympic sailing gold medalist said, “I went to New York for the announcement, and we’re absolutely delighted that Bermuda won the bid, with their historical ties to Britain. 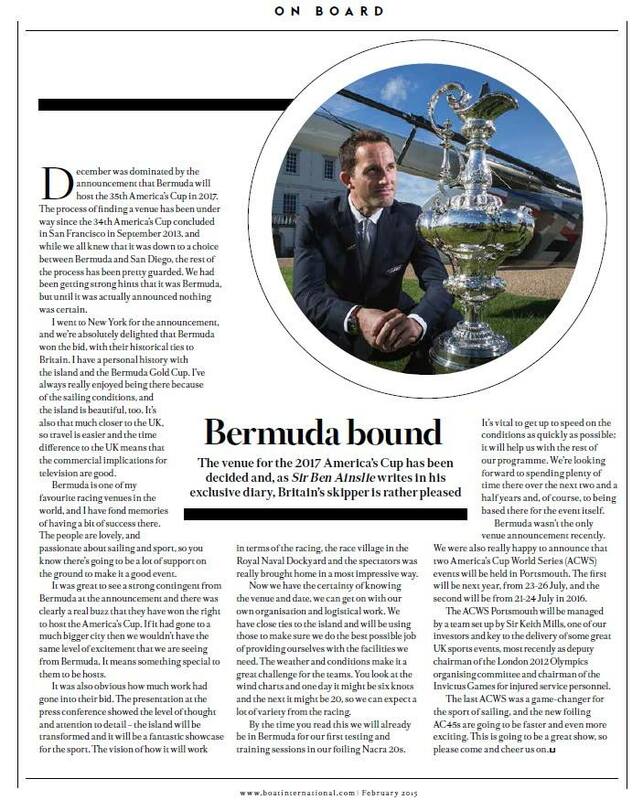 I have a personal history with the island and the Bermuda Gold Cup. “Bermuda is one of my favourite racing venues in the world, and I have fond memories of having a bit of success there.The people are lovely, and passionate about sailing and sport, so you know there’s going to be a lot of support on the ground to make it a good event. “It was great to see a strong contingent from Bermuda at the announcement and there was clearly a real buzz that they have won the right to host the America’s Cup. If it had gone to a much bigger city then we wouldn’t have the same level of excitement that we are seeing from Bermuda. It means something special to them to be hosts,” continued Sir Ben. Launched in 1983, Boat International Magazine bills itself as the “world’s only truly international, monthly, English language luxury yachting magazine” and is distributed in 55 countries. Sir Ben’s team — Ben Ainslie Racing — is one of six teams that have entered the race for the 35th America’s Cup, along with the defending champion Oracle Team USA, Artemis Racing from Sweden, Emirates Team from New Zealand, Luna Rossa Challenge from Italy as well as Team France. Ahhhhhhh just the words we should be hearing all the time. Sailing community worldwide wild about coming here. Anyone who has sailed or competed in these waters will tell you they are thrilled, others who haven’t are absolutely excited at prospect. Bermuda may be small on map but huge news in sailing community worldwide.